Michael Fiala speaks about resistance to the Cleveland Airshow, November 2, 2018. Photo by Ruth Benn. I’ll be writing a more in-depth reflection on our Cleveland meeting for the next newsletter, but suffice it to say, it was a terrific weekend! The primary organizer of the weekend was the amazing Maria Smith, whose care and thoughtfulness and deep roots in Cleveland were evident in each activity. We met a variety of people who are intertwined with her activist communities and her work. Thank you, Maria! 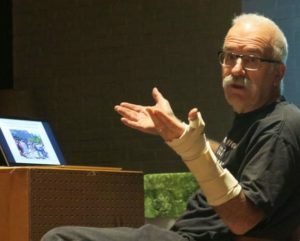 Friday night’s Cleveland Airshow protest presentation, led by Mike Fiala and with contributions from several other participants, gave us a sense of what resistance to military glorification looks like in Cleveland. I recorded this presentation and will be editing it for YouTube in the coming weeks, so look for that announcement! The large group discussion following our small group breakout sessions on NWTRCC and WTR strategy, tactics, fundraising, and other topics. Photo by Erica Leigh. On Saturday morning, we began with an assortment of small group strategic discussions. 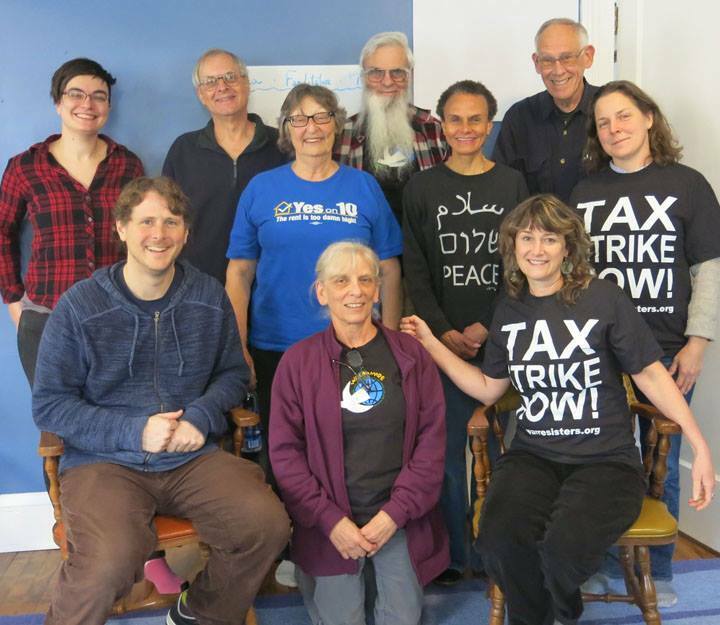 We primarily addressed fundraising for NWTRCC and methods of reaching out to individuals and groups about war tax resistance. Some very good ideas for future NWTRCC work and work by affiliates came out of this discussion. I want to give a special thanks to Lincoln for coming up with the discussion plan – it worked great! We had a delicious catered lunch on Sunday noon from local caterers! I’ll plan to write more about this in the next newsletter. On Saturday afternoon we watched a very special screening of the upcoming film The Pacifist, of which war tax resister Larry Bassett is the subject. The film is beautifully shot and takes the viewer through Larry’s journey of conscience as he refuses to pay over $100,000 in taxes. We also were glad to have Larry joining us by computer after the screening so we could ask him some questions about his resistance and how it’s affected his life, his kids, and other circumstances! While the film isn’t yet available to the public, an audio version of the film is FREE online through the Spotify and Apple Music audio streaming services (sign-up required). You can also watch a scene from the film on Facebook. Patt Needham speaks about the proposal to create a peace exhibit at Great Lakes Science Center. Photo by Ruth Benn. After that, Patt Needham of the Cleveland Nonviolence Network talked about the group’s work to get a science exhibit on peace from a neurological perspective installed at the local Great Lakes Science Center, and there was a discussion about ways to appeal to the science center and angles for the exhibit to take. And on Saturday night, we watched the film Dispatches from Cleveland, which centers around the police killing of 12-year-old Tamir Rice in Cleveland in 2014. The film also explores foreclosures, racism, lack of economic opportunity, and other closely related issues affecting East Cleveland communities. 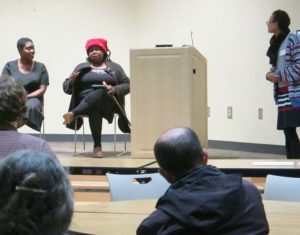 Maria Smith facilitated an animated and fascinating Q&A period with activists Genevieve Mitchell and Cherima Chungag on issues facing the black community in Cleveland, including racism, militarism, and poverty. 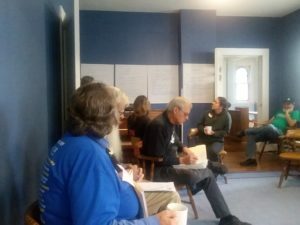 Sunday brought us a NWTRCC business meeting, with the announced departures of consultants Erica Leigh and Sarah Mueller and a proposal being passed to create a new Outreach Consultant to combine aspects of this outreach and communications work. 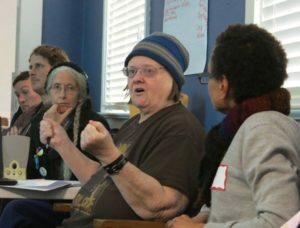 We also granted $750 to Maine WTR Resource Center, endorsed the No to NATO actions taking place on March 30 and April 4 organized by United National Antiwar Coalition, and passed the proposal to create an ad hoc Youth Advisory Committee to help NWTRCC evaluate its literature and messaging. In the afternoon, we had a session for war tax resistance counselors, discussing a variety of issues around counseling philosophies. We particularly focused on the difference between directive and non-directive counseling, and technical and motivational counseling (focusing on the technical details of filing, deductions, and potential IRS enforcement actions versus focusing on someone’s motivation for considering WTR and motivations behind what actions they might want to take). I hope that we’ll have a lot more to say on this subject in the coming weeks and months! Although the WTR-related activities during the weekend were not as well attended as many of us would have liked, it was terrifically organized and had a variety of satisfying activities and discussions. (We did have 25-30 people at each of our evening events though!). As usual, I came away with a lot of ideas bouncing around my head for what to do next, especially as I wrap up my paid work for NWTRCC and consider my future involvement. It was great to see you all! Till next time. The group after our Sunday morning business meeting, including our fantastic gathering organizer, Maria Smith (in the Peace shirt). Photo by DeCourcy Squire.